Search and read the full-text of ebooks. Consult online reference books, including Bible dictionaries, commentaries, lexicons and atlases. Search in over 60 different subject databases for journal articles on your topic. Use online media, including audiobooks, streaming videos and music. 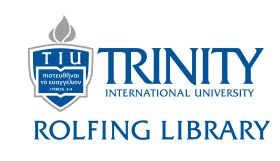 You can request scans of journal article and sections of books from Trinity's library and libraries around the world. This means you can access nearly any journal article you need. Use local theological libraries that participate in ATLA reciprocal borrowing. If you are unable to access a print book at a nearby library, the Rolfing library will mail you a book.